Children's and teen literature from the perspective of a Brit living in America. Bench, Wolf and Deedee are Frost’s people, they make up his middle school tribe – he eats lunch with them, plays Dungeon and Dragons with them at weekends, and supports them in their passions. They have been together for years and are planning to cruise through middle and high school together. But then two things happen: the school principal bans cellphones and Rose Holland starts at their school. These catalysts test the boys’ friendship and reveals the level of cruelty that anonymity can bring out in 8th graders. The cellphone ban generates a new method of communication – unsigned post-it notes. Many are just harmless notes to friends but a few are hate-filled. 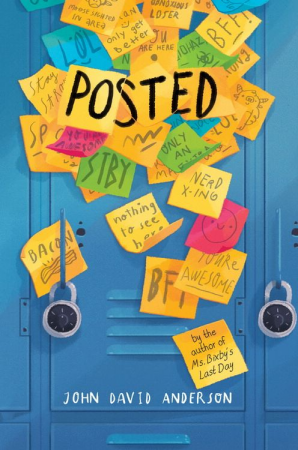 The novel starts like an Andrew Clements novel with a funny situation at a school, but quickly gets much darker and more nuanced as it tackles middle school social dynamics rather than elementary school ones. Frost, the narrator and the poet of the group, can only watch as his tribe fractures. Bench (so-called because of where he tends to spend most sports games) is not keen on letting Rose join them and when he makes a stunning catch in a football game and becomes part of the jock crowd he drifts away from them. Sensitive Wolf, a gifted pianist, bonds with Rose as they are both outsiders who become the target of post-it bullying. Only Dungeon master Indian American Deedee seems comfortable, or perhaps oblivious, with the status quo. Rose, “tall and wide,” has moved around from school to school and knows all about name-calling and bullying. Set in a small town in Michigan, the novel zooms out from the school and portrays a variety of family structures and dynamics, and the effect that can have on a child. Frost’s parents are bitterly divorced, whereas Wolf’s are bitterly still together. Mr Anderson seems comfortable to move between fantasy and novels, and writes equally adeptly in both genres. Kids who enjoyed Ms Bixby’s Last Day, should be happy to move up to the middle school machinations of Posted. Schwartz & Wade, May 2018. Typically the women who married Henry VIII are seen, as the subtitle of this book suggests, purely as adjuncts to the King and are remembered best for the way he disposed of them: Divorced, beheaded, died, divorced, beheaded, survived as the rhyme goes. This book aims to flesh out these women with each telling her own story, and written by a different female YA author, with some short interjections from Henry, written by M. T. Anderson. What becomes apparent from each story is the powerlessness of royal and aristocratic women in the 16th century. Each were offered up to the king to secure advantages for their families, whether British or European. Once married, their sole purpose was to provide a son and heir. Those that failed to do that were either divorced or executed for treason. The only two queens who seemed to get anything out of their marriages were Anna of Cleves, who seemed to be quite happy to be divorced and left to her own devices, and Kateryn Parr, who had a taste of power while Henry was off fighting wars in France and then nearly overstepped herself but, in the end, outlived her husband. In this novel, Henry is written as a bragging oblivious Trumpian figure, manipulated by the powerful men he raises up to run the country according to his whims. He believes he is irresistible to women, even when his suppurating ulcers make him stink and he is so vast he has to be lowered onto his bed by a team of servants. So it follows naturally that when his two youngest and prettiest wives – shrewd Anne Boleyn and party girl Catherine Howard – are suspected of adultery he has them executed. While most of this will be familiar, to an extent at least, to British teens, it is almost unknown to American ones (I say this having done a completely unscientific survey by asking six students at my school what they knew about Henry VIII). This means it really has to entice and entertain on its own merits and I’m afraid it doesn’t quite pull that off. The first story, which needs to be juicily intriguing, just isn’t. Unfortunately, Henry’s first wife, the dutiful and deeply religious Katherine of Aragon (written by Candace Fleming) is not particularly interesting. The poor women gave birth to seven children of which only one daughter, later Queen Mary, survived. Once she is no longer able to bear children, Henry is desperate to move on, and desperate to bed the seductive Anne Boleyn. The machinations of the divorce, which entails Henry breaking from Rome and the Catholic Church, just don’t make for very good reading and Katherine comes across as rather dull and dry. The remaining stories are a mixed bag but steadily improve. Anne (by Stephanie Hemphill), writing from her prison in the Tower of London, gets things going a bit more but we are with her in her last days, which tinge the vibrancy of her life with melancholy. The meek and mousy Jane Seymour (by Lisa Ann Sandell) is given just a hint of malice, but her story is short and ends with her dying after giving birth to the much-desired son, the sickly Edward. The novel really picks up with Anna of Cleves (by Jennifer Donnelly), as her pragmatic outlook on her lot gives her a much more sympathetic contemporary feel. 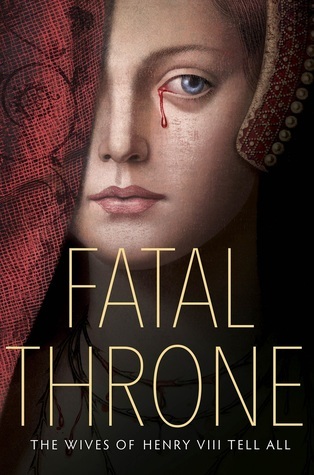 Poor Catherine Howard (by Linda Sue Park) is bracingly sexual and, unsatisfied by her old and virtually impotent husband, tragically looks elsewhere for satisfaction. Finally the survivor, Kateryn Parr (by Deborah Hopkinson) relishes her own intellect and is able to outsmart the Bishops who feel she is too much a Reformist and a bad influence on the KIng. The impact of the political and religious changes of the era are much more far-reaching, though less sizzling, than the fact that Henry married 6 times, though Henry’s desire for a male heir was what catalyzed it. Henry’s split from Rome, the dissolution of the monasteries, and the battle between the different wings of the Church all had more serious consequences for the country and for Europe. To be honest, I can’t see this book getting much traction with American teens as it’s an obscure bit of history that just isn’t that rivetingly written. This flawed YA realistic novel, reminiscent of recent events at real life St Paul’s, is a timely look at sexual assault and the silence that surrounds it. When white 15 year-old narrator Sam Barker gets a scholarship to elite Edwards Academy, she records her perspectives in an anonymous blog. 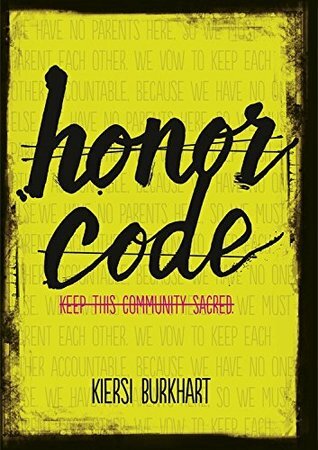 She is stunned on her first evening when the girls in her dorm are subjected to a body check and she is told she “needs to improve.” As well as this hazing, she finds that, despite the school’s honor code, drinking, and smoking are also tacitly accepted. She develops a crush on rich, popular senior, Scully Chapman, also white, so when the Head Girl matches her with Scully for the Mixer dance she is thrilled. The reader might find her strangely unquestioning of why this would happen, particularly given her low self-esteem. After a couple more dates, inevitably she goes to Scully’s room and he rapes her. Scared to go to a teacher or the police, she takes her story to Harper, a black investigative journalist. As Sam pursues justice, she is vilified online and ostracized by Edwards students, but the new Sam, forged in steel by her quest, persists in wanting to attend the school to achieve her dream of going to Harvard Law School. I found Sam a slightly unconvincing character. We are told that her self esteem is crushed by the body check, but the author doesn’t show credibly her evolution from this naive “Firstie” to crusader for vengeance. Similarly, her friendship with “topaz”-skinned Gracie, her roommate, is crucial to the plot but I never felt the tight bond that Sam tells us they have. There is a final plot twist which is both unnecessary and actually undermines the main argument of the novel. Though justice is served, at least to an extent, the novel unwittingly gives weight to a counter argument that it never addresses. While I wouldn’t say this makes the novel unacceptable, I feel that, along with the weak characterization and tendency to tell not show, there are bound to be better novels to meet the #MeToo moment. Nonetheless, readers might appreciate a young woman taking on the system when history suggests the odds are against her. 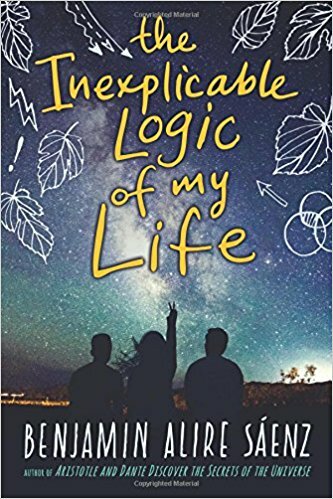 Salvador Silva is just starting senior year at high school and finds that his comfortable life is about to be disrupted both externally and internally. His grandmother, Mima, is dying of cancer, his best friend Sam is having difficulties with her mother, and his other good friend, Fito, is having even worse family troubles. And then Sal himself is feeling different – he punches a kid and then another, which is so not how he has been brought up. There are some traditional and non-traditional families in this book and a lot of dead mothers. A lot. Sal himself is a white boy who was adopted by Vicente, a gay Mexican American, after his mother died when he was three. He doesn’t know who his birth father is and begins to suspect that these aggressive feelings must come from him. Vicente gives him a letter from his mother but Sal doesn’t feel quite ready to open it yet. Vicente is the sort of saint-like parent that you only get in novels (or at least I don’t know any of them, myself included). He has sacrificed his life for Sal and always has the right thing to say or do, no matter how difficult the problem. When a boyfriend from the past returns, the family is expanded as Marcos turns out to be similarly saintly. There’s also the sibling bonds that Sal has created with Sam and, tentatively, with Fito, both Latinx. Sam is smart and confident but is fractured by her relationship with her mother, and unusually for a YA novel, her feelings for Sal stay at a sisterly level. Fito is also smart but because of his family dynamics, he feels worthless and that he deserves nothing. The writing is easy but precise, short chapters often punctuated with text conversations. The author creates a warm, loving family even if it is not traditional. Sal has his moments, but the reader knows that with the loving support he gets from his father, relatives, and friends – all of whom make up his family – he’s going to be ok. 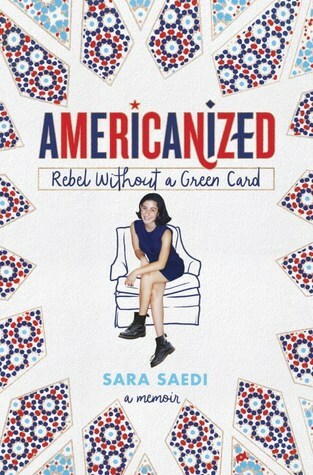 This breezy memoir about growing up Iranian American in Northern California is shot through with Sara’s family’s struggles to secure legal status. Much of Sara’s teen life has the same concerns as any other American teen – why doesn’t the boy I like like not like like me in return? How come my older sister is so much cooler than me? What am I going to do with my life? Is my nose too big? But there is a dark underside as well, as her loving parents, who left Iran and sought political asylum during the 1979 revolution, will go to any length to secure a green card, including getting divorced (and later remarrying because it proved to be unnecessary). We are welcomed into Sara’s large extended family, getting some of the background of their lives in pre-revolutionary Iran as well as how they have integrated their culture into their Bay Area home, giving a picture of Tehran and Iranians that is far closer to Western life than the terrorists shown in the news. Topping and tailing the memoir is a brief history of post-colonial Iran and a primer on the complexities of immigration status. By making her background open and accessible, Sara offers both a mirror and a window for American teen readers.